Royal jelly (RJ) is a type of natural health product with a long history of use. Royal jelly peptides (RJPs) obtained from RJ have numerous bioactivities. To study the neuroprotective effect of RJPs, major royal jelly proteins were digested into crude RJPs and subsequently purified by RP-HPLC. Purified RJP fractions were evaluated in N2a/APP695swe cells. 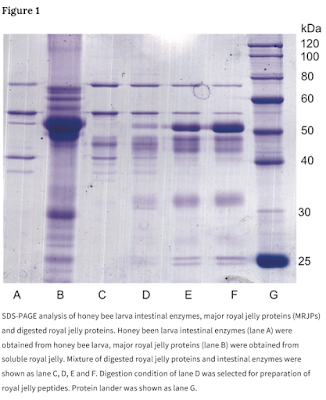 Our results indicated that purified royal jelly peptides (RJPs) (1-9 μg/mL) could inhibit external beta-amyloid 40 (Aβ1-40) and beta-amyloid 42 (Aβ1-42) production through the down-regulation of β-secretase (BACE1) in N2a/APP695 cells. The modulation of BACE1 may be related to histone acetylation modification. Our results demonstrated a neuroprotective function of RJPs, which indicates that RJPs may serve as potential β-secretase inhibitors in ameliorating Aβ-related pathology in Alzheimer's Disease.